Rustic weddings will often feature warm autumnal colors including orange, yellow, and burgundy. Rustic can be used to describe a large variety of wedding attire, decor, and themes. It can be both relaxed and formal. Rustic weddings will often feature warm autumnal colors including orange, yellow, and burgundy. 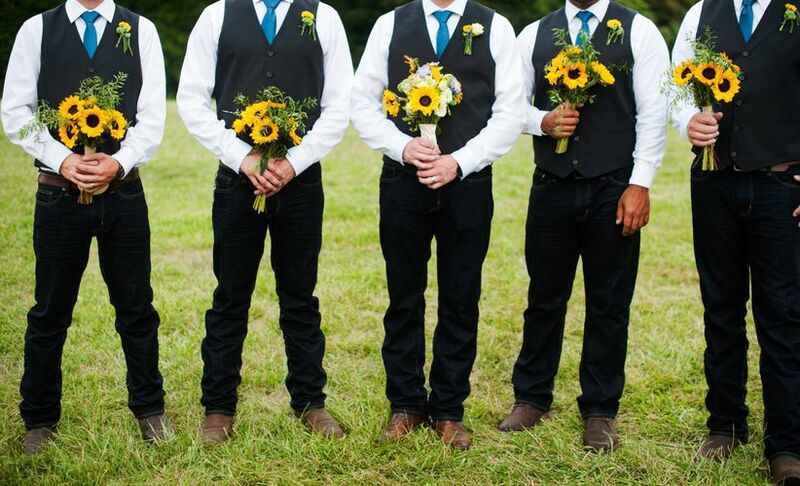 Below are a selection of rustic wedding attire for grooms. 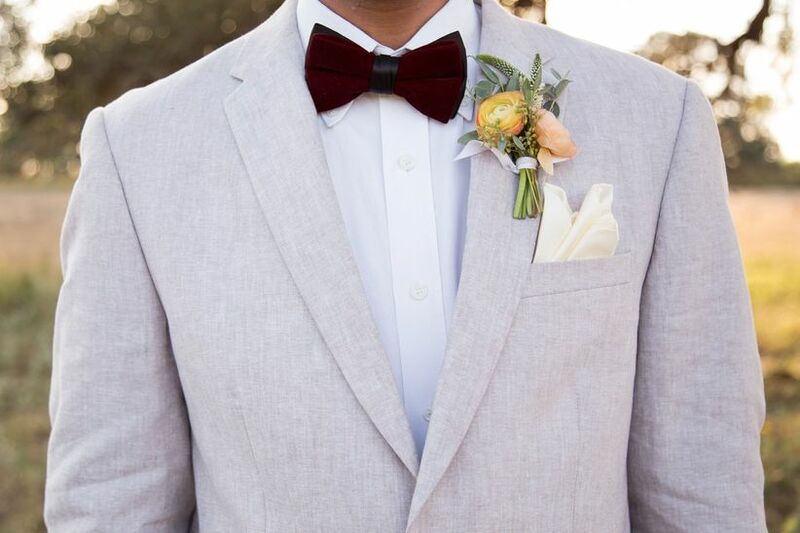 This groom looked dapper in a light suit paired with a white button down, burgundy bowtie, and cream pocket square. 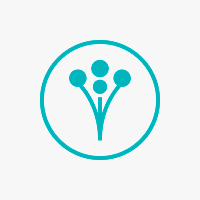 He completed the look with a ranunculus boutonniere. For a more relaxed look, these gents dressed in black vests, dark wash jeans, and bright blue neckties. 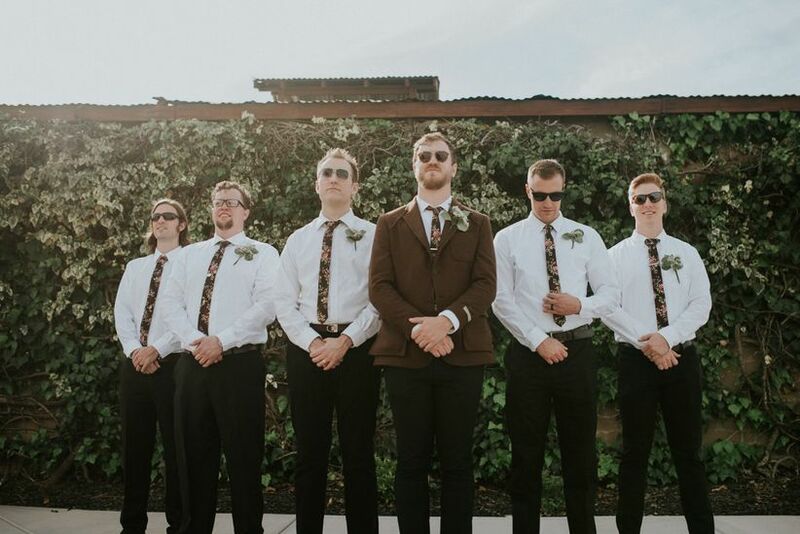 f you’re planning to go with a super laid-back wedding, take it from this groom and his groomsmen. 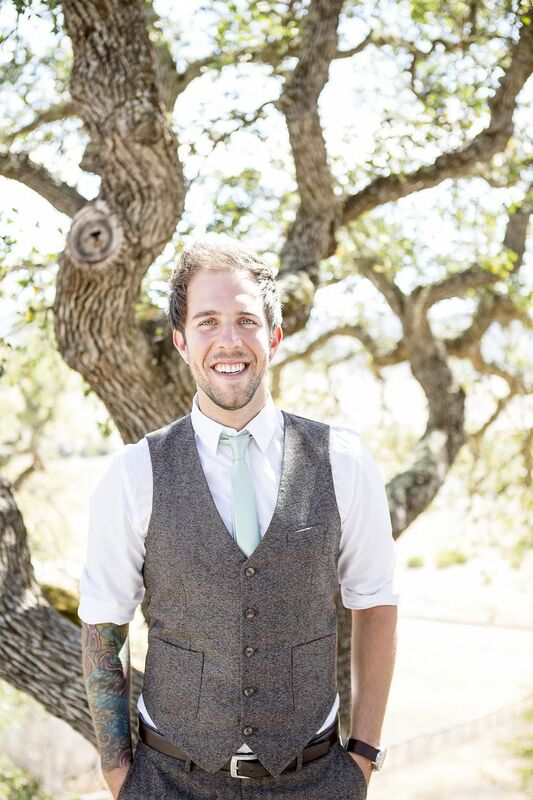 The groom donned khakis, a green button down, tweed vest, and matching necktie. 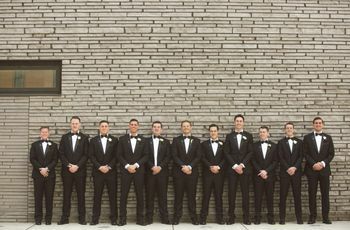 While his groomsmen opted for lighter pants, chambray button downs, and beige bowties. 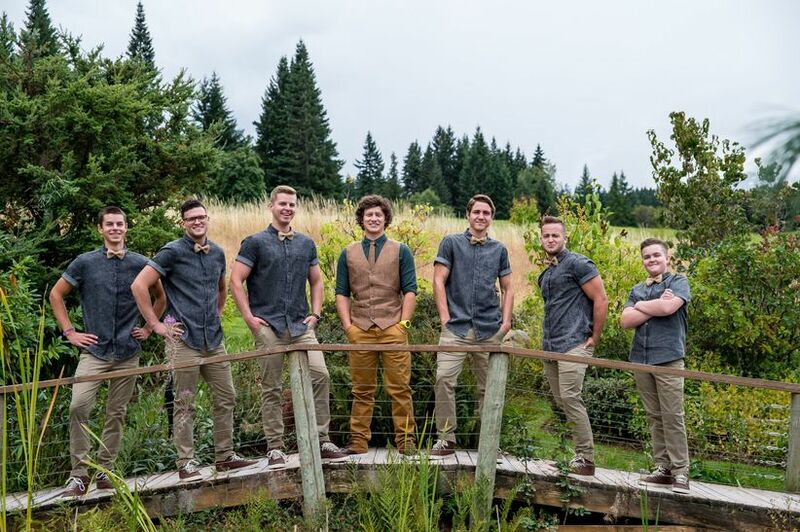 This groom and his groomsmen went with a slightly more formal look of khaki slacks, matching vests, pale blue button downs, and vibrant ties. 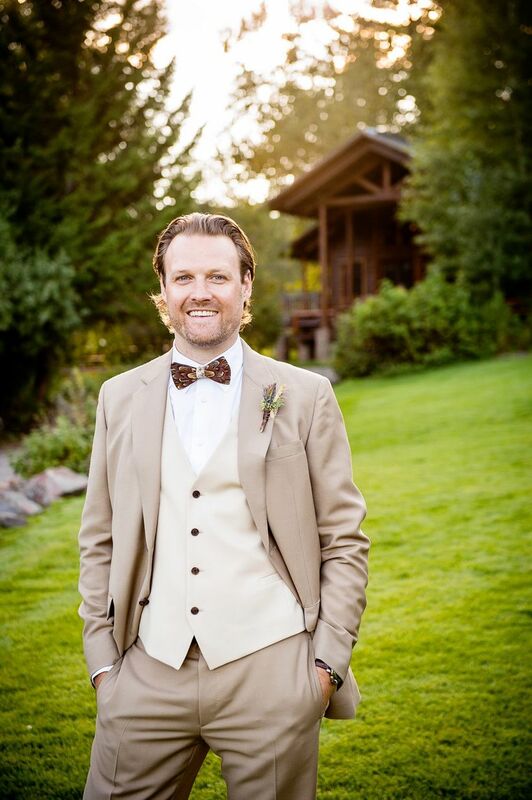 This handsome groom wore a warm brown suit with lighter vest. He accessorized with a feather bowtie and wildflower boutonniere. Hosting a wedding in a colder climate? 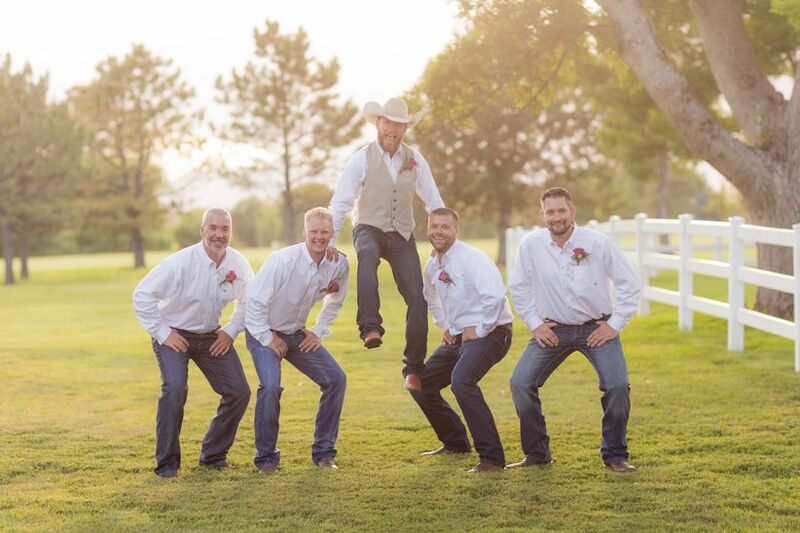 Be like this groom and his groomsmen. They opted for dark slacks and floral ties, with the groom donning a herringbone jacket. 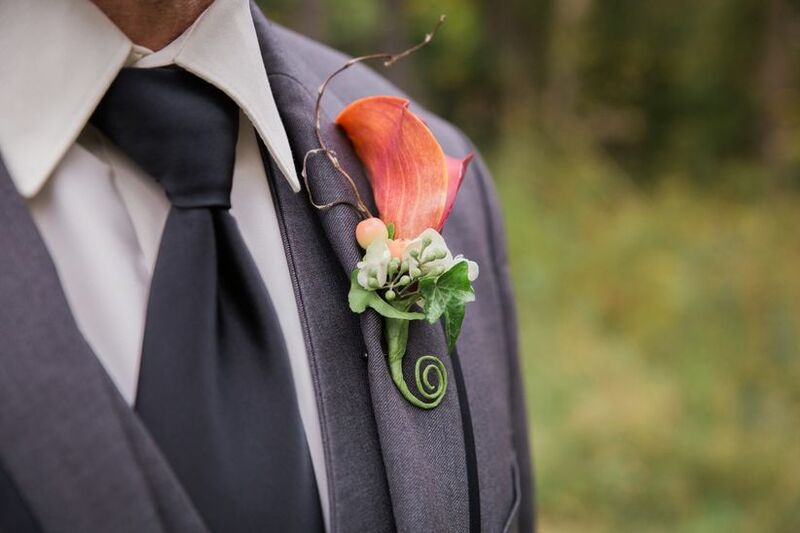 If you’re still looking to wear a tux on your big day, draw in some rustic vibes like this groom did with his gorgeous calla lily and fiddlehead fern boutonniere. 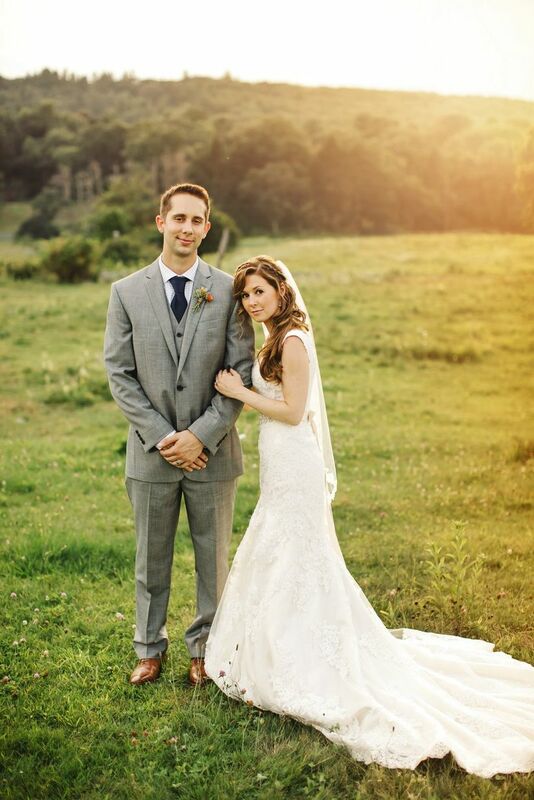 In a similar formal style, this groom looked dashing in a light grey tux paired with a dark-hued necktie. 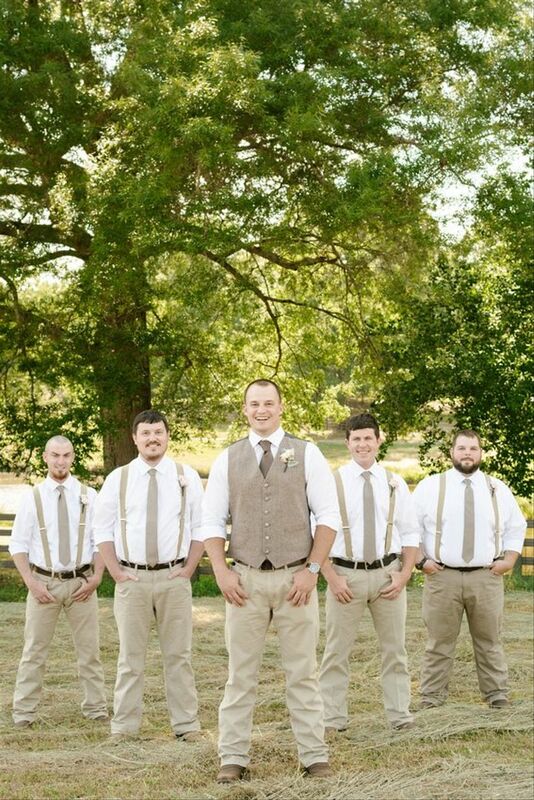 We’re loving this casual groom and his groomsmen in khaki slacks paired with white button downs with darker brown ties. These men look handsome in khaki jackets, paired with dark jeans and bright purple neckties. The completed the look with bright floral boutonnieres. 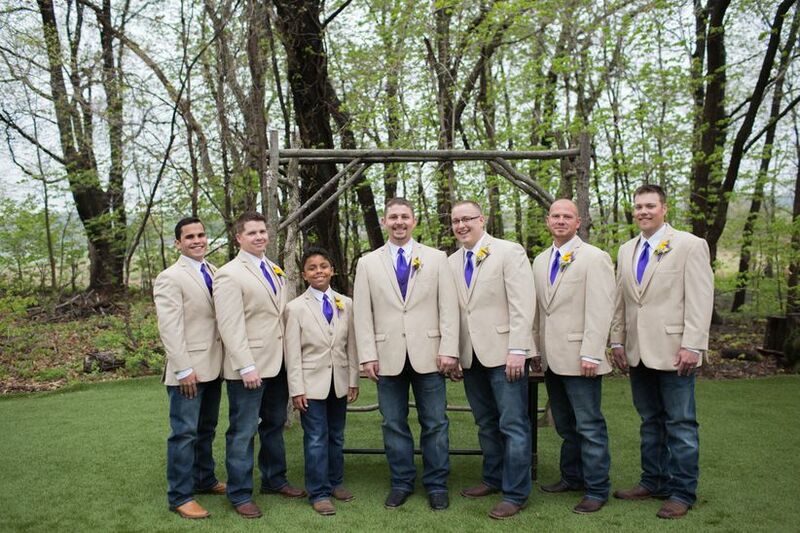 Rustic looks can be dressed and dressed down like this groom in his groomsmen. 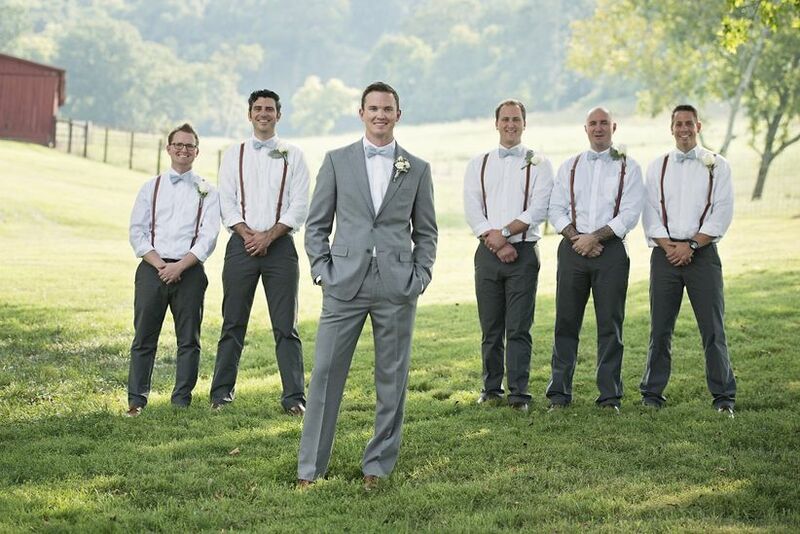 The groom opted for a light grey suit while his groomsmen donned darker-hued slacks, paired with burgundy suspenders and light-colored bowties. 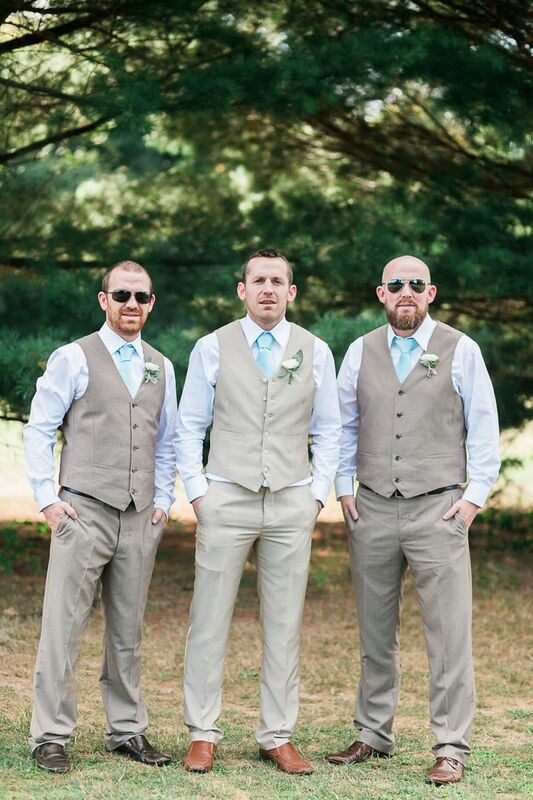 We can’t get enough of this groom’s tweed vest and matching vest, which made his mint-colored necktie pop! 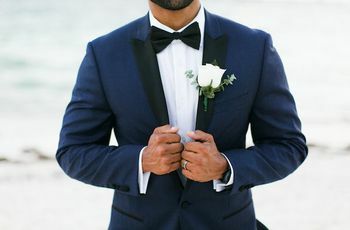 Bride & Bridesmaids Black Tie and Formal Attire for Grooms Here are a few options for both formal and black tie attire for grooms.